Inspiration for poems in this collection, and other similar poems I have written, seem to come from two sources: First and foremost is my sense that there is an inherent being-ness in all things, an inscape to the observable landscape. 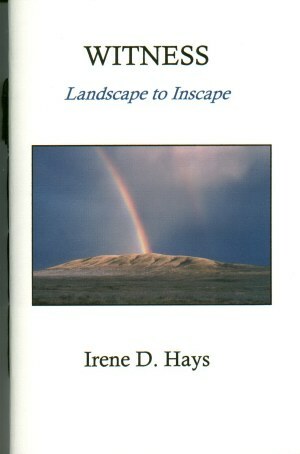 The inscape in human and other-than human nature is revealed and reflected and recognized as it resonates with the land. Furthermore, it seems that the external horizon line may set the limit, or preconfigure the inscape, the pattern or rhythm of a life. Thus, the landscape affects the inscape and vice versa. Of course, I learned along the way that this sense is not peculiar to me, but, in fact, is probably universal. British Victorian poet and Jesuit priest Gerard Manley Hopkins described the phenomenon, and before him, medieval philosopher Duns Scotus, and later major American Nature Writer Mary Austin, among others. - Opens children to a sense of wonder and awe that stimulates imaginations and spiritual consciousness. The benefits of experience with Nature are more likely to occur when people establish a relationship with Nature based on particulars, rather than generalizing from a distance. One of the best ways to establish and deepen a personal, reciprocal relationship with Nature is to reflect on and write about a special place or special natural beings or parts of the natural world. Young people who come to know first hand the beauty, joy, drama, care, love, and passion in the natural world may bond with Nature in ways that may sustain their spirits and their health. who will be the witness? our return to each other and ourselves? a yellow tinge to gray-green sagebrush. flow for miles, lavender to blue. Harbor the nook where nighthawk nests. and its little sister, delicate sego. no lower ground will do. Irene D. Hays, Ed.D. began her career as a teacher of language and literature in Idaho and Hawaii and in Washington State - where she was born and has returned to live. For 20 years, she was first a technical writer, and later science education director for Battelle at national laboratories in Richland and Seattle, Washington, and in Golden, Colorado. She also worked as a research analyst in Santa Barbara, California and as a scholar-in-residence at the Lawrence Hall of Science in Berkeley, California. She led the development of innovative regional and national partnerships that brought hundreds of students and teachers together with scientists in laboratory and field research. There she observed firsthand the beauty, joy, drama, care, love, and passion of science - which she names the “hidden humanity.” With the heart of a poet and the eye of a scientist, she shares through her poems the essence and meaning of her enduring love affair with words and with Nature. Her poems have appeared in literary journals and other print and electronic media. Pudding House published her first chapbook, The Measure of Loss, in early 2007.
is a 40 page hand-stitched chapbook.